This issue of the e-News is for the special purpose of inviting one and all to the presentation about the upcoming reconstruction of Verona Road and the Beltline. The meeting is on Wed., June 2, 7 p.m., at Prairie UU Society. Check out the Articles 1 & 2 and attachments 1 & 2. Other news is also included. 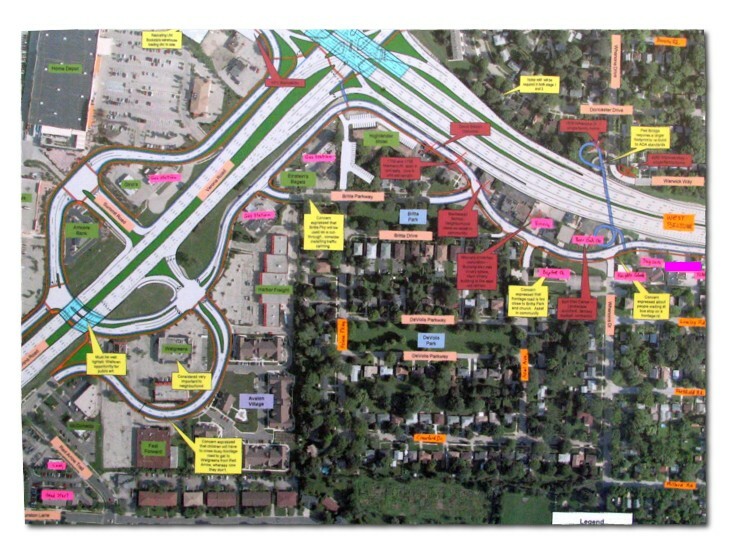 1 - Highway Reconstruction Meeting – Just for Us – June 2, 7 p.m.
7 - Madison Parks Swimming Lessons – Not Just for Kids! For months you’ve been seeing notices and articles about the fast-approaching re-make of the Verona Road/Beltline highways. Perhaps you have even received the hardcopy flyer being distributed in the neighborhood now. If your curiosity has been piqued about exactly, exactly what’s planned, June 2 is a chance to find out with a minimum of effort. Learn how the reconstruction will affect YOU! 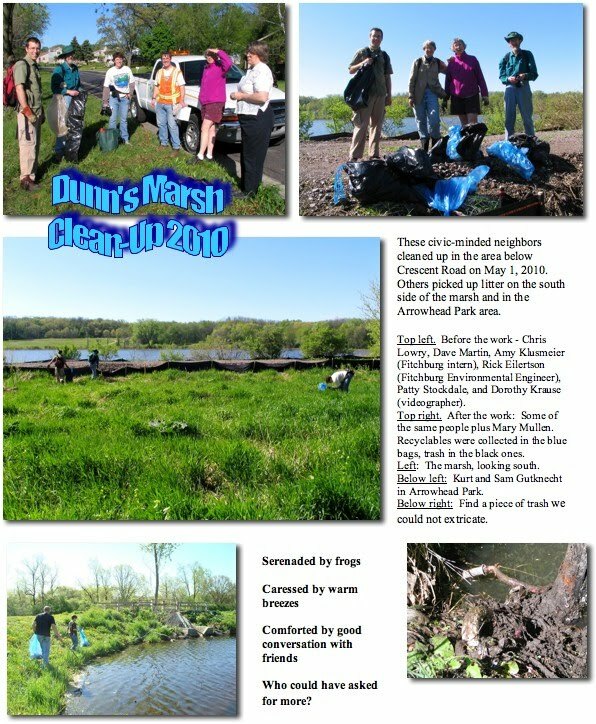 The Dunn’s Marsh Neighborhood Association has arranged a special presentation for Wednesday, June 2, 7 p.m., at Prairie Unitarian Universalist Society, corner of Whenona and Crawford. Strand Associates and the Wisconsin DOT will be making a brief presentation. Questions and comments will be welcome from all neighbors attending. Large maps will be available to study close up. It is hoped that this meeting will be in contrast to the meetings held earlier this year at the Boys and Girls Club. At the upcoming meeting sponsored by the DMNA, the presentation will be shorter, and ample time will be provided for questions and discussion. At previous meetings sponsored by the DOT, most people were directed to talk privately with DOT and Strand personnel about their questions and concerns which meant that the audience as a whole missed a lot of information. In the smaller venue of Prairie UU, it should be much easier to see the graphics and maps as well. Please come to this meeting. It may be your last and best chance to learn about the plans before the Supplemental Draft Environmental Impact Statement (SDEIS) comes out. It may also be your last chance to speak prior to the public hearing on the project. The public hearing will be scheduled for sometime within the 45-day comment period for the SDEIS. Current estimates of when the SDEIS will be completed range into the early fall. The presenters will bring detailed maps that will help you see which residences and businesses will be demolished, how the pedestrian overpass will be affected, where the frontage roads will be changed, and how pedestrians, bicyclists, and motor vehicles can cross Verona Road or get onto it. Be aware, changes will be made, and they will affect how much traffic passes by our homes and how we get into and out of the neighborhood. See you at the meeting Wednesday night? 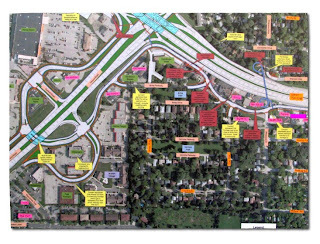 Although you probably cannot actually read the text in the colored boxes on the attached map of the Verona Rd./Beltline reconstruction project, the color key is shown below. Large maps that show this and more will be available at the June 2 meeting (7 p.m., Prairie UU Society). On those maps you will be able to see exactly what is written in each box. There’s always something new to learn about how computers and their software work. 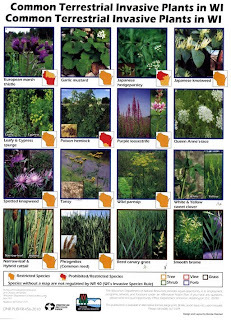 I have just learned that the picture of invasive plants I sent last month only showed one page of a 2-page flyer from Department of Natural Resources. 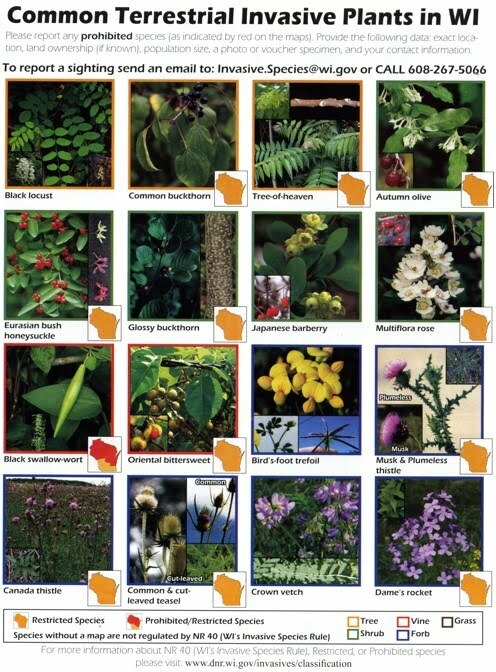 Click on the attachment to see page one of the flyer with contains pictures of honeysuckle, buckthorn, several thistles, and the showy phlox look-alike Dame’s Rocket. That’s the page that was obscured last time. If you are like me, perhaps you did not notice that there’s a key at the bottom of the pages that explains whether the plant is regulated as a restricted or prohibited species or whether it is totally unregulated. 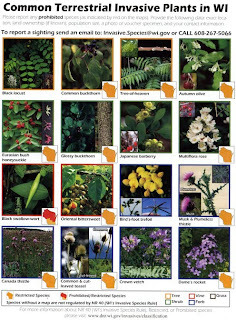 Of the total of 32 species, most are “restricted,” 4 are prohibited in parts of the state, and 7 are completely unregulated. Unregulated invasives are black locust, Japanese barberry, bird’s foot trefoil, crown vetch, white & yellow sweet clover, reed canary grass, and smooth brome grass. Our neighborhood is competing with 15 others to see how many families will sign up to have a portion or all of their electric bill priced at the “Green Power” rate. To see what this might mean for you and also to sign up, go to www.mge.com/greenpower <http://www.mge.com/greenpower> . You can participate for as little as $3.75 extra each month. Signup should be completed by September 2010. Greenpower Challenge households are helping Madison Gas and Electric reach its state-mandated goal of 10% renewable energy by the end of 2015. Ride the Drive is a free community event that celebrates Madison’s extraordinary commitment to non-motorized transportation and support for healthy lifestyles. This year it will be held on Sunday, June 6, 2010. The Ride the Drive event will transform some Madison streets (see attached map) into a public promenade. Closing streets to motorized traffic will provide access for bicycles, strollers, skaters and foot traffic. This will enable participants to see the City from a whole new perspective and encourage them to incorporate non-motorized travel into their lifestyle. The June 6, 2010 route is a 6-mile loop from East Washington Avenue to State Street to North Shore Drive to John Nolen Drive. In the late 1960’s, the City of Madison began purchasing land in what is now Cherokee Marsh. This large and diverse wetland needed to be preserved for future generations. Since formally establishing a Conservation Parks Program in 1971, the City of Madison Parks Division has acquired and manages over 1600 acres of conservation parkland. The City now has 14 different conservation parks. To help people become more acquainted with the conservation parks, Madison Parks is hosting free monthly tours of Madison Conservation Parks. The tours will be led by a Madison Parks staff member and will focus on a unique park and unique natural feature of that park. Each conservation park focuses on the restoration of native plant and animal communities while providing educational areas and opportunities for all. • June 10, 6:30p.m. Owen Park, 6021 Old Sauk Road. Learn more about the Owen Park ponds and their wildlife. • July 14, 6:30p.m. Edna Taylor Conservation Park, 802 Femrite Drive. Exploring oak savannah and effigy mounds restoration. • August 15, 7:00a.m. Cherokee Marsh, Upper Yahara River Tour. Bring your own canoe or kayak and meet at the School Road boat landing. Partnering with the Madison Audubon Society, the tour will focus on the restoration work on Cherokee Marsh. • October 23, 7:00p.m. Cherokee Marsh, 6098 N. Sherman Ave. Full Moon Walk, followed by a campfire and hot cocoa! Adult Beginner Swim Lessons. The course is designed for adults who are beginner swimmers. The course will orient you to the aquatic environment so you feel comfortable in the water. Skills taught include: basic swimming strokes, front crawl, elementary backstroke, breastroke and sidestroke; deep water introduction; and endurance swimming. Skills are customized to individual class needs and expectations. Masters Swim. An organized, coached workout program promoting fitness for adults through the sport of swimming. Swimmers should be able to to swim 500 yards non-stop. Stroke mechanics and analysis by an experienced masters swimmer and coach. Participants may sign up for one of the three courses or may participate on a drop-in basis for $8.00/day. Easy Stretching / Gentle Joints. Enjoy a new class just for adults. Does not require swimming skills. Follow the instructor’s lead as you progress through class with gentle stretching of muscles and loosening of joints. Direct your written comments to the Pedestrian/Bicycle/Motor Vehicle Commission, c/o City Traffic Engineering Division, PO Box 2986, Madison WI 53701-2986, or email to traffic@cityofmadison.com. The results of the public hearing and written comments will be used to develop a list of projects to be considered for inclusion in the 2011-2013 construction work program. On Monday, June 21, the Madison Plan Commission will hold a public hearing on the draft zoning code. The public hearing will be held in room 201 of the City-County Building, which is located at 210 Martin Luther King, Jr. Boulevard. Since early 2008, the City of Madison has been working on the zoning code rewrite with a consultant team led by the Cuningham Group, P.A. The existing zoning code was last rewritten in 1966. The new zoning code will be easier to use and understand than the current code, better enable the City to implement its Comprehensive Plan and other plans, and help the community achieve its sustainability goals. The zoning code rewrite project is expected to be complete in 2011 after the adoption of a new zoning map which will be prepared after adoption of the new zoning code. The new zoning code and map will ultimately be adopted by the Common Council after review by the City Plan Commission, Zoning Code Rewrite Advisory Committee, other City boards, committees and commissions and the public. Please visit the project website www.cityofmadison.com/zoningrewrite <http://www.cityofmadison.com/zoningrewrite <http://www.cityofmadison.com/zoningrewrite> > for more information. Project information can also be found at the City’s Legistar site under file # 15932. Allied Wellness Coop Extravaganza Saturday - Free! This issue of the DMNA e-News is primarily to invite you to the ALLIED WELLNESS CENTER EXTRAVAGANZA this coming Saturday, May 22, starting at 11:30 a.m. Also, learn about PHASE 2 OF ALLIED DRIVE REDEVELOPMENT. Note: Some events are listed and described ONLY in the Calendar. Saturday, May 22, 11:30-3:00 p.m. – Allied Wellness Extravaganza – on Allied Drive. Read Article 1 for details of location. Check out the 2 attachments. Wed., May 26, 7 p.m. and every 2nd and 4th Wednesday – Neighborhood Verona Road project group meets at MacDonald’s to learn more information and plan strategies to lessen the impact on our neighborhood. For more information, contact DMNA Council member Jo Kelley at jokelley@tds.net or 276-8010. See article 2. Wed., June 2, 7 p.m. – Neighborhood meeting, question & answer session about planned Verona Road/Beltline reconstruction plans. Prairie UU Society, corner of Crawford and Whenona. We are expecting a short presentation by the Wisconsin Department of Transportation & Strand Associates followed by a more lengthy time for questions, answers, and comments. Come and get your questions answered and speak your mind about what you see and hear. We hope this will be tailored to meet our needs rather than be a total rehash of past presentations. Tuesday, June15, 7 p.m. – DMNA Council. Prairie UU Society, corner of Crawford and Whenona. Any resident may attend, but only Council members may vote. What is it? It’s the Allied Wellness Cooperative (AWC), a new organization dedicated to helping people learn how to help themselves. The Extravaganza starts at 11:30 a.m. with a little ceremony at and in honor of the new Allied-Dunn’s Marsh Neighborhood Association sign that sits at the head of Allied Drive. By noon it moves over to the Joining Forces For Families a little further down the street at 2225 Allied. At JFF, expect a welcome, entertainment, a cookout, and container garden planting and painting. Finally, at 3 p.m. it will move still further down Allied for the Prairie Crossing planting ceremony. So, you are saying, what’s going to be at the cookout, and how am I going to be entertained? Answers for food: hot dogs including some veggie dogs, sodas, some side dishes, and desserts. Answers for entertainment: a sidewalk sale, a skit about the TimeBanks, and a drumline. And… Mr. Green Jeans will be reading stories to children. Of course, it will also be a chance to meet good people who are working hard for the good of the neighborhood. The Extravaganza is sponsored by the Allied Wellness Center, the Allied-Dunn’s Marsh Neighborhood Association, the TimeBank, the Madison Apprenticeship Program, and the Dunn’s Marsh Neighborhood Association. Check out the flyers – one in Spanish – for a more graphic invitation to this event. The City of Madison has made a big investment in the redevelopment of Allied Drive, but you may have been wondering why 2/3 of the land is still vacant. Well, wonder no more. The Dunn’s Marsh Neighborhood Council has learned that Phase 2 is about to happen. And the word came straight from the horse’s mouth, so to speak. At the May 18 Council meeting Kelly Thompsen-Frater of the Madison Community Development Authority (CDA) gave a 45-minute presentation on the plans for Phase 2. They are different than originally proposed in that Phase 2 will take place at the foot of Allied instead of the middle, but otherwise they weren’t that much of a surprise. Here’s the latest. The lower third of the cleared land on the east side of Allied will be subdivided into 48 lots for the purpose of building 48 single family homes - or maybe a few less single family homes and a very few duplexes. Rather than have one developer do all the homes – as was true in the Renaissance development which is between the Allied land and Red Arrow Trail – these lots will be sold one or two at a time to a variety of buyers. The CDA plans to start this fall by building 3 houses, and then individuals or non-profits may buy a lot or two at a time and build immediately. Thompsen-Frater emphasized that no one will be able to buy a lot and let it sit vacant for years, nor would anyone be allowed to buy 2 lots and then put up one house in the middle. The idea is to get these homes up right away and to be certain that they are of quality construction and appearance. The roads are being constructed right now. In addition, this is the time for building when private home starts are down and government can aid in getting houses built and sold. What will these homes be like? First of all, they are likely to be comparable in size to the units in Renaissance. They will be 2- to 3-bedroom homes with full basements. While they probably won’t all have the same look since they will be built by various entities, the CDA will have deed restrictions, guidelines, and requirements. For example, a certain kind of siding might be specified or porches might be required. Landscaping will definitely be mandated. Some might be the live-work units that people have suggested might be good for Allied that has no businesses along its entire length. Not storefronts, Thompsen-Frater hastened to mention, but say a portion of the house devoted to a business like an accounting business, or a hair or nail salon. Since the City wants to promote home ownership among people who might not have a chance to become owners otherwise, various schemes will be employed to make these homes more affordable. About a third will be sold at market rate, a third at below 50% of market rate, and the other third between those two values. Market rate is estimated to be at $175,000 to $225,000 per home plus $24,900 for the lot. How can houses be sold for less than market rate? Several ways. Downpayment aid. Forgiveness on second mortgages with up to $20,000 to be forgiven if the owner stays for a certain number of years, say 5 or 10. Lower interest rate mortgages. Section 8 homebuyer vouchers. But a major emphasis will be to sell only to people who can really meet the terms of the payments. The CDA doesn’t want to engender a bunch of foreclosures because the would-be owners didn’t have the means to continue paying the mortgage. Homebuyers don’t have to be first-time owners. Council members and residents at the meeting had several questions. Carol Poole who is also a Fitchburg alder, asked if any park space would be dedicated. The answer was that there’s some open space within the development as a whole and that Belmar Park nearby and the larger Marlborough Park which is more distant are both available. In other words, No. But about 15 garden plots were shown as part of this phase of development. Carol also asked what the chances are that high density apartments would be put into the middle section which will remain undeveloped for now and was previously designated for condos. Kelly Thompsen-Frater thought that single family homes might go there. Jeff Glazer suggested that services needed to be closer to people and that a small Stop-N-Go type market might be appropriate. The response was that the area couldn’t support a market. Sina Davis asked if residents would have any say in what goes into Phase 3. The answer was affirmative. Mary Mullen expressed concern about home maintenance: would people moving into these homes, especially those who might never have had any maintenance responsibilities, have any support in learning how to fix things that go wrong such as leaky faucets or broken hinges. Thompsen-Frater said that the CDA is helping people in the new rental units learn how to maintain their apartments, and some of these renters might turn out to be the new homeowners. She also said that Home Depot is looking forward to having seminars on home maintenance and WHEDA wants this to happen. Jo Kelley wondered aloud about whether the people in this new development would feel like a part of the neighborhood if many come from “outside.” Thompsen-Frater then mentioned that a neighborhood association would be set up for this development of 48 homes that would be “overseeing” things there once the CDA is no longer involved. This brought out several comments. Already there are 2 neighborhood associations with overlapping boundaries. Wouldn’t a third association be too many? Wouldn’t this set the development apart from the rest of the neighborhood? The Council also learned that the 138 apartments in the completed part of the redevelopment are all rented and there is a waiting list of 340 people! Note: Some events are listed and described ONLY in the Calendar. All articles by Mary Mullen unless indicated otherwise. Tuesday, May 18, 7 p.m. – DMNA Council. Prairie UU Society, corner of Crawford and Whenona. Any resident may attend, but only Council members may vote. Tuesday, May 18 and throughout May on different days – HospiceCare Grief Support Groups - See article. These are quality groups and well worth trying if you have had a death in the family or are struggling with end of life issues. See article 10. Wed., May 19, 7 p.m. - Fitchburg Public Library Long Range Planning Public Meeting, Stoner Prairie Room, Fitchburg Community Center, 5520 Lacy Road. Give input on the priorities and goals for the library's services and collections! Questions? Call 270-4205 or e-mail library@city.fitchburg.wi.us. Wed., May 19 – NO liquor license hearings. These applications will be removed from the agenda until the applicants reapply and meet with the DMNA and neighborhood. We have the written promise of both Ald. Brian Solomon and Ald. Mike Verveer that this will be done. Don’t waste your time going to the Alcohol License Review Board today. See article 1. After months of being on tenterhooks about whether to attend hearings before the Alcohol License Review Board (ALRC), the neighborhood can relax for a bit in regards to applications for liquor licenses for two establishments on the Beltline Frontage Road. Both Alder Brian Solomon who represents the Madison area of our neighborhood and Alder Mike Verveer who serves on the Madison ALRC have assured DMNA President Jeff Glazer that both applications will be “placed on file” at the ALRC meeting this Wednesday, May 19. Placing on file means that the applicants will have to reapply, although they may do so as soon as the next month. Neighbors need not attend this ALRC meeting. re-referring month to month at least 3-4 times. This is not fair to neighbors and I'm getting kind of tired of it. Thanks, Brian. I'm sorry that I didn't get back to you last week about these items. Consider your reasonable request granted. I will move Wednesday that the ALRC place these items on file without prejudice. That would allow the respective applicants to start the process again with a new application in the future. It is inappropriate to keep these applications pending any longer. The two locations are at 4265 and 4245 West Beltline Frontage Road, the stucco house at the corner of Danbury Rd. which Tom Caputo had wanted to turn into Bernie and Tony’s Piano Bar & Sicilian Restaurante, and Faouzi’s Restaurant, the old Blarney Stone Bar, located 2 doors to the east. Meantime, Faouzi’s has opened as a restaurant that does not serve alcohol. Faouzi’s serves Moroccan cuisine and is open 9 a.m. to 10 p.m. These applications had first come before Madison’s ALRC on December 16, 2009. The hearings were attended by nearly a dozen neighborhood people who expressed serious reservations about opening bars on the frontage road where there is already a liquor store. The applications were referred to the next month with instructions to meet specific conditions and then referred month to month when neither applicant met the conditions set forth by the ALRC. Mr. Caputo was advised to get an approved parking plan and apply for an entertainment license. The Faouzi applicants were told that their application could not be considered because it wasn’t completely filled out and also could not include Mr. Faouzi because of his alcohol-related convictions. ALRC members also questioned the statistics provided by the Faouzi applicant about how much revenue would come from alcohol and how much from food sales. Both applicants were advised to get together with the neighborhood to work out differences. Nothing has been forthcoming from either one. It was a small but intense and, at times, noisy group of individuals who occupied the front corner of MacDonald’s on May 12. With the help of a big map and their collective knowledge of the Verona Road project, they convinced Alder Brian Solomon that there are a myriad of issues that he, as our representative, should act on. Alder Solomon began with a statement that other than pollution and relocation concerns, he basically liked Phase 1 of the Verona Road reconstruction project. He said he especially liked the jug handle crossing under Verona Road, the interchange at the Beltline that will allow simultaneous left-hand turns, and what he called improved pedestrian/bike connections. He did express serious opposition to Phase 3 of the project that would locate Verona Road in a trench and allow full-speed access to the Beltline via flyways. His premise that “Realistically, changing the way we commute won’t happen in the foreseeable future of 20-30 years,” and statement that there was really nothing he could do about the project did not resonate with his listeners. Hearts fell. But this group of citizens was not giving up and obviously felt that it is inappropriate for any elected representative to bow out without a struggle. By the end of the meeting with the Verona Road Justice Coalition group, Solomon had developed an action plan involving both himself and the people who had invited him to the meeting. He also apologized for his original statement of powerlessness. The Verona Road Justice Coalition group that night included people from 3 neighborhoods. Five of the 8 attendees were from the Dunn’s Marsh Neighborhood: Connie Roderick, Kim Zinski, Jim Lyne, Cathy Casper, and Mary Mullen. Bill McCarthy and Ted Collins attended from the Westchester area west of Verona Road in the vicinity of Raymond Road. They have been involved for years in trying to mitigate the effects of the project. The eighth person was Joceylyn Riley who represents the quadrant behind Dorn Hardware and along the Beltline known as Summit Woods. All interested residents of the areas affected by this reconstruction project are invited to come to meetings which are held on the second and fourth Wednesdays of each month at MacDonald’s at 7 p.m. For more information, contact Jo Kelley jokelley@tds.net or 276-8010. Or go to http://groups.google.com/group/verona-road-justice-coalition <http://groups.google.com/group/verona-road-justice-coalition> which is the website devoted to sharing information about the reconstruction project. Note: If this link doesn’t work, simply copy it and paste it into the address blank of your Internet browser. On the right side of the opening page is a link that allows you to join this group and then add your own thoughts. All are invited to add their concerns. It was neighbor Jim Lyne who set up the Google Group about the Verona Road project. Thanks, Jim. It’s Connie Roderick who manages the group. During the opening day at the Marlborough Park community gardens May 15, six orchard enthusiasts planted as many plum trees on the west side of the park between the plowed and no-till gardens. They were a gift from Hilltop Community Farm LLC. The Allied Wellness Center has applied to the Fruit Tree Planting Foundation for further orchard plantings. To vote for an orchard in Marlborough Park, go to www.communitiestakeroot.com <http://www.communitiestakeroot.com> and cast your vote for the Allied Wellness Center application. This orchard application presently has 918 votes. The current leaders have vote totals of 13,097, 10,170, 8,356, and 7,738 votes. You may vote once a day! A bright light has been installed on the Marlborough Park kids’ playground as a security measure. Several years ago vandals burned the playground. A new, slightly relocated, and larger playground was built the next year with input from a committee of neighbors about the new equipment. In a meeting between neighborhood leaders and park officials, a light was promised. Finally it has been installed. 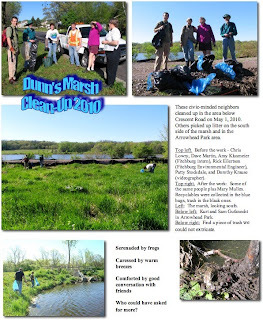 Serenaded by frogs, caressed by gentle breezes, delighted by the gurgling brook, warmed by the sun and good conversation, 4 neighbors and a Fitchburg intern picked up trash and recyclables from the waterway running to Dunn’s Marsh behind the Dunn’s Marsh Apartments and the Megan’s Bay condos on May 1. The participants were Chris Lowry, Dave Martin, Patty Stockdale, and Mary Mullen from the neighborhood, and Amy Klusmeier, the intern. Other groups were doing the same further west at Arrowhead Park below Chalet Gardens and on the south side of Dunn’s Marsh. The groups were coordinated by Fitchburg Environmental Engineer Rick Eilertson who briefly spoke to the group before joining the Arrowhead group. Those in the Arrowhead group were Rick, Felipe (another Fitchburg employee), and Kurt and Sam Gutknecht. The good news is that there was much, much less litter than in previous years. Or perhaps the group found less because of the advanced season that had produced tall grass that may have hidden what would’ve been obvious otherwise. Those hundreds of you who didn’t join in missed more than you can imagine! Now that spring has really sprung, it’s time to search out and destroy the invasive plants that might have a foothold in your yard. We all recognize the prickly thistles and the delicate Queen Anne’s Lace, but other plants are equally problematic. Foremost among them might be the pungent Garlic Mustard and the pretty Dame’s Rocket that are blooming and setting seed right now. Take a look at the picture sheet that is an attachment to this e-News. It shows 32 – yes, 32! 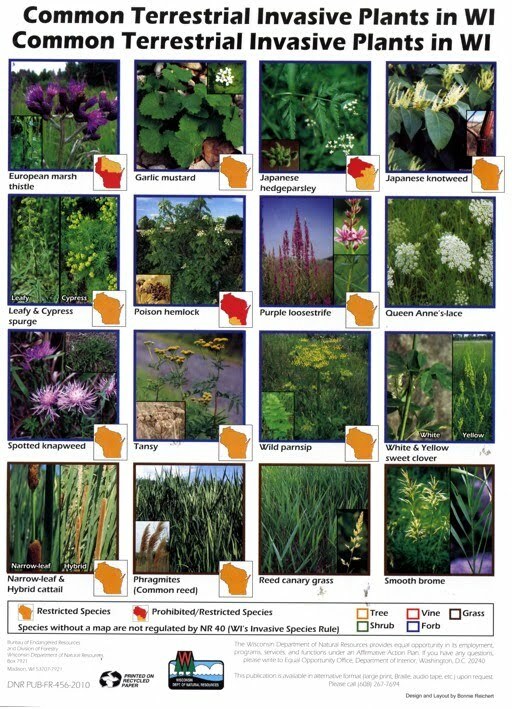 – terrestrial invasive plants in Wisconsin. If you are wondering how to tell Dame’s Rocket from the similar-looking phlox, just count the petals. Dame’s Rocket, the invasive pink, white, and purple flower, has 4 petals. Phlox have one more. Both the tall, showy Dame’s Rocket and the yellow-green leafy spurge are evident along some of the Beltline embankments east of Fish Hatchery Road. Camp Pawprint is a series of week-long day camps held at the Dane County Humane Society. Campers age 7 to 15 enjoy animal-related lessons and activities while having fun with other animal lovers! Activities include humane education lessons, critter projects, group games, and daily presentations from local animal experts. All campers spend time interacting with our camp animals and getting hands-on experience providing daily care and socialization. For more information <">">http://www.giveshelter.org/sitemgr/camp_pawprint#daycamps> <http://www.giveshelter.org/sitemgr/camp_pawprint#daycamps> <http://www.giveshelter.org/sitemgr/camp_pawprint#daycamps> Eight of the 10 camps still have openings. A limited number of scholarships is available. In May, HospiceCare Inc. will begin a grief support group series and offer three recurring support groups for those grieving the death of a loved one. HospiceCare will also offer an informational seminar for caregivers. All groups are open to the public and are free of charge. All groups require pre-registration and are held at the Don & Marilyn Anderson HospiceCare Center, 5395 E. Cheryl Parkway, Madison, unless otherwise noted. · Bridges Weekly Support Group is held every Wednesday, from 9:30 a.m. to 11:00 a.m. This open-ended, weekly group is for adults who have suffered a loss due to death. Pre-registration is not required. · Introduction to Grief is held the first Wednesday of every month, from 6:30 p.m. to 7:30 p.m. This hour-long presentation covers the common reactions of those who are grieving, offers suggestions to navigate the grieving process and provides information about HospiceCare grief support groups. · Young Widows Group is held the first Thursday of every month, from 7:00 p.m. to 9:00 p.m., at San Damiano’s, 4123 Monona Drive in Madison. This monthly group is for women under the age of 50 who have experienced the loss of their spouse/partner due to death. This group is held in collaboration with The Center for Life and Loss Integration and Gunderson Funeral Home. To register, call HospiceCare at (608) 276-4660 and ask to speak with a grief counselor.